Social media platforms have become such a powerful communication and marketing tool that even SNA publishes resources to help teach nutrition programs how to create effective social media strategy. While online communities continue to grow and change, Facebook still remains one of the most used social platform, even compared to Instagram and Twitter. With so many active users, Facebook can be a huge asset to promoting your program and encouraging parents to have their kids grab lunch at school. So let's make sure we're doing everything we can to grab their attention and get real returns with your Facebook social strategy. Does your program have a logo? Use that for your profile picture! Or, use a picture of your school, cafeteria, or employees. Profile images that are recognizable can add credibility and help people find your page. Cover photos are a great way to show your program's personality. Use this space to feature your program's meals or events! Try and keep your cover photo more visual and less wordy. 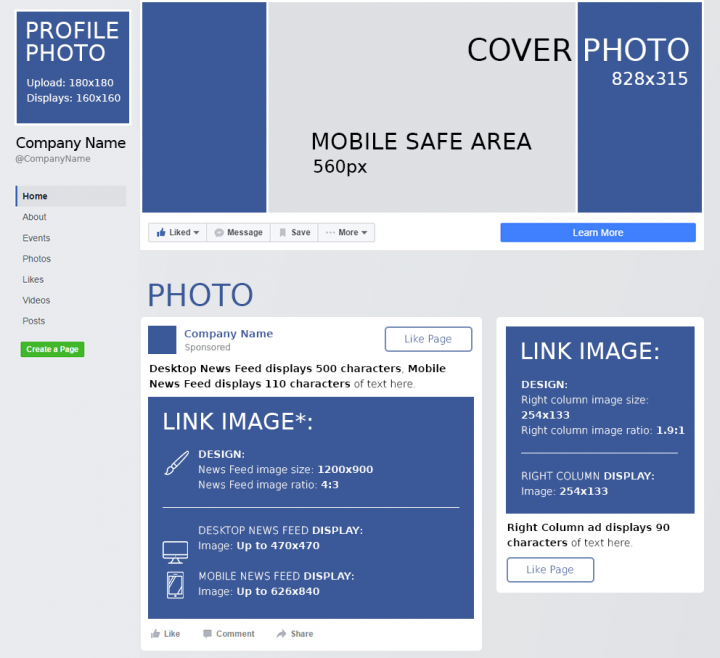 Use DreamGrow's Facebook Cheat Sheet to size your cover photo correctly. Ideally, posting once a day is the sweet spot. But that goal can be hard to hit week after week! We've found that posting at least once a week can help build your online presence. Find some inspiration on what to post from these other schools nutrition Facebook pages! This may seem obvious but it's worth noting that you should never post any confidential, private, or personal information about yourself, your staff, or your students to any online social platform. It is generally not acceptable to post pictures of students without the written consent of their parents. It's extremely important to know if your school has specific guidelines for social media and photo sharing to ensure you are adhering to all rules. Names, especially full names, should never be used with a picture of a student. If you are unsure about a post or photo, you should always reference your school district's rules and guidelines before sharing anything online. A hashtag is used as a way to categorize posts and make them easier to find in a search. For example during SNA's National School Lunch Week, SNA will announce their hashtag and encourage districts to use it any time they post their celebrations on social media. So if you want to look back at 2017's celebrations, you can use #NSLW17 and see a thread of relevant posts! Don't use too many hashtags: Limit yourself to 1-2 hashtags per post. More than 3 hashtags can clutter your post, dilute your message, and come across as spam-y. Keep your hashtags short: Longer hashtags are hard to read and take up a lot of character space. Make up your own unique hashtag: You don't always have to use existing hashtags - consider creating new ones specific to your school! For example, come up with a hashtag for your school's Taco Tuesday meal and every time you post a photo from Tuesday lunchtime be sure to add the hashtag. Do some reasearch: If you're going to jump-in on a commonly used hashtag, be sure to look at who else is using it and what the conversations around the hashtag look like. You may find a few vioces and opinions associated with that hashtag that you don't want your school affiliated with. Remember, hashtags are meant to strengthen your message and connect you to a specific audience, but they're not 100% necessary. If you have a post that doesn't work with a hashtag, that's okay! Hashtags should serve a purpose, so don't feel like you have to use one every time you post. Here are a few more tips and guides for how to properly use hashtags. Try to avoid using images that are blurry, off topic, or low-quality. It's important to remember that your page represents your program, so using good quality images that showcase your messages speaks volumes. In today's world, people expect everything to be fast and convenient. As such, when someone posts a question to your page or messages you for information, they'll likely expect an answer relatively quickly. While this isn't always possible, it is important to make responding to those messages a priority. An easy way to do this is to designate 1-2 times a day to check-in on your page. Designating a few 10-minute time slots for social media check-ins allows you to focus entirely on responding to messages or liking comments without taking too much time away from your day job. Receiving criticism is never fun and it's not easy to respond to. However, on a public platform like Facebook, saying nothing at all to a negative comment can actually say a lot more. It's good practice to respond to every post, positive or negative. When someone is experiencing a problem: First and foremost if the problem is caused by something your school may be responsible for, apologize and offer a resolution. If the problem is not directly related to your school, it is still very important to apologize and try to assist. When someone is vulgar or inappropriate: We recommend hiding comments you deem inappropriate to avoid other fans seeing them. When you hide a comment, the person who posted it will not know that their message has been hidden. They will continue to see their post as if it's still publicly visible. If they're concerns are valid, reach out to them in a private message to resolve any issues. Make connections - that's what social media is all about! Follow the School Nutrition Association, fellow nutrition program pages, or your school district's general page. Connecting with relevant pages can help boost your page and give you valuable content to share with your followers. And of course, connect with Heartland and MySchoolBucks to stay up-to-date with us!